Indian High Court To Consider Jailed Activist's Case Dr. Binayak Sen, a civil-liberties advocate, faces a life sentence for sedition. Supporters say he is being persecuted for defending the rights of tribal people in one of India's poorest states. Opponents, however, say he supported an outlawed rebel group that was blamed for thousands of civilian deaths. Binayak Sen, an Indian physician, greets relatives last December in Raipur. He was given a life sentence after being convicted of helping Maoist rebels in a case widely criticized by human-rights groups. A case in India concerning a physician and civil-liberties advocate who faces a life sentence for sedition has drawn worldwide attention from human-rights groups, including Amnesty International. Supporters of Binayak Sen say he is being persecuted for defending the rights of tribal people in one of India's poorest states. Opponents, however, say the doctor supported an outlawed rebel group that was blamed for thousands of civilian deaths. Sen's case has been a cause celebre among human-rights activists ever since his arrest in May 2007. Before this, he was best known for his award-winning medical work among the rural poor of India's eastern Chhattisgarh state. But Sen was also a civil-liberties advocate and a vocal critic of the state's methods in its fight against the Maoist rebels, who have a strong presence in Chhattisgarh and other less-developed Indian states. Sen accused the police of brutalizing and killing tribal people suspected of aiding the rebels in the jungles where they live. He also charged that corrupt state officials and corporate interests were grabbing land that belonged to the tribal groups, and exploiting that land for timber and mineral resources. 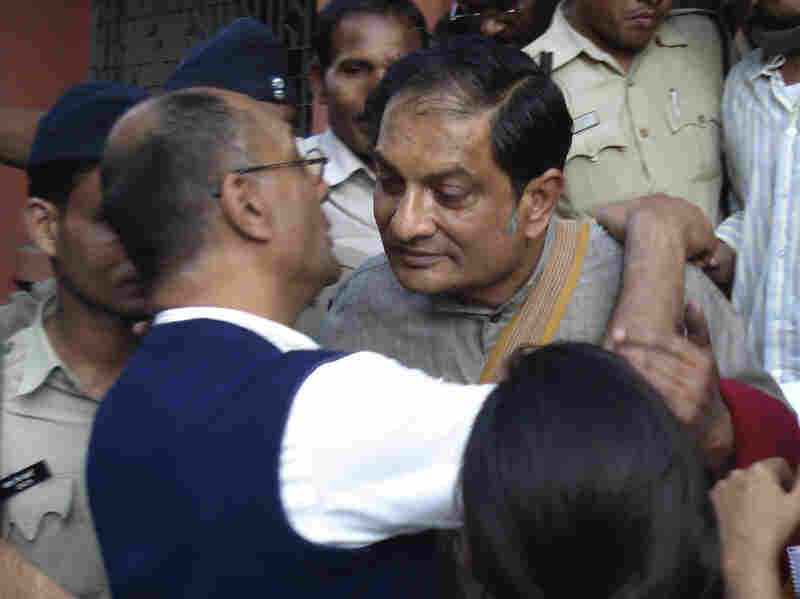 Sen paid several visits to jailed Maoist leader Narayan Sanyal, and police accused Sen of acting as a courier for the rebels. The controversy over Sen's case was reignited in December, when a state court convicted the 61-year-old doctor on sedition charges and sentenced him to life in prison. Since then, there have been protests on Sen's behalf throughout India, mostly on college campuses. 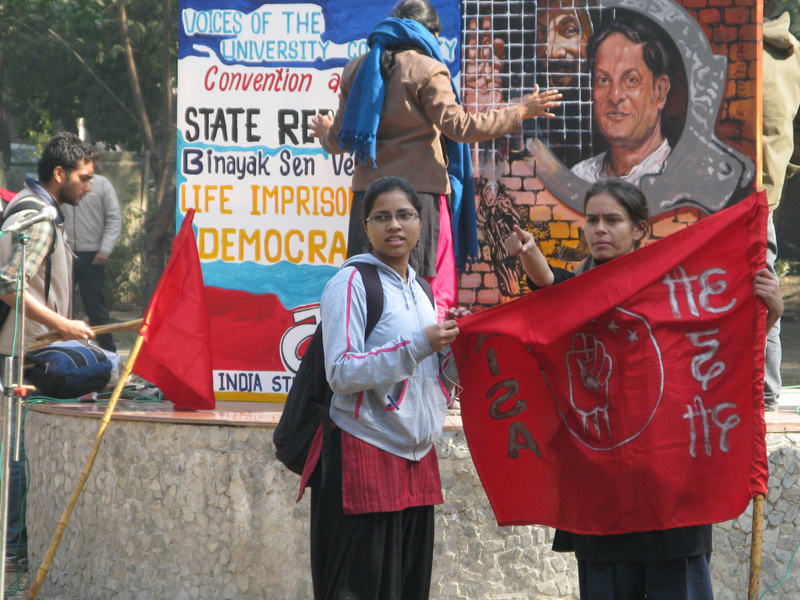 Students at Delhi University prepare for a demonstration in support of Binayak Sen, who faces life in prison. A recent one at Delhi University drew hundreds of students from colleges around the city for a day of protest songs, poetry and speeches demanding Sen's release. The crowd was galvanized by slogan-chanting activists, some of whom waved the red flags of the left-wing organizing group the All India Students Association. Public-interest lawyer Prashant Bhushan, one of the speakers at the event, worked on the case of one of Sen's co-defendants. He says Sen is the victim of a siege mentality among Chhattisgarh state officials who equate any dissent with support for the Maoists. Any dissenter, he says, "particularly one who is opposing the economic policies of the state — handing over the land of the tribals to these big corporations — is being branded as a Maoist and targeted." Many of Sen's supporters say his prosecution is payback from state officials whom he accused of corruption and collusion with business interests. But opponents say Sen is guilty of more than peacefully sympathizing with the plight of impoverished tribal people. Chandan Mitra is the editor of the Hindu nationalist newspaper The Pioneer and a member of parliament from the opposition Bharatiya Janata Party. He says that Sen espouses a violent ideology. "The people he supports have been indulging in acts of wanton violence, killing people and vowing to overthrow the democratically constituted state of India," he says. Mitra says the left-wing academics and intellectuals who support Sen forget that India is in a life-or-death struggle with guerrilla fighters who are aiming to create a "red corridor" through India, from Nepal in the north to Sri Lanka in the south. There is no evidence that Binayak has ever been involved in inciting violence against the state, or has ever said anything seditious that would challenge the constitution of the state, or the constitution itself. Sen, he says, knew what he was doing when he allegedly aided those rebels. "I think it's a fairly clear-cut case where somebody knowingly did something which was wrong, in the existing law, and therefore has been punished," he says. Most of the activists who have been supporting Sen believe the case against him will fall apart once it leaves the Chhattisgarh court system and moves up to the Indian Supreme Court. Nandini Sundar, an anthropologist who has worked extensively with the tribal people in Chhattisgarh, says the law is clearly on Sen's side. "There is no evidence that Binayak has ever been involved in inciting violence against the state, or has ever said anything seditious that would challenge the constitution of the state, or the constitution itself," she says. Sundar, who heads the sociology department at Delhi University, says the reason Sen raised the ire of state officials is that he pointed out that they were not observing the rule of law in the first place. It's not clear yet how long it will take Sen's appeal to reach the Supreme Court.